Karen Norling is no stranger to the diseases that can befall our canines. A dog owner for many years, she has experienced her fair share first hand with her beloved dog, Oreo, as she recalls here. 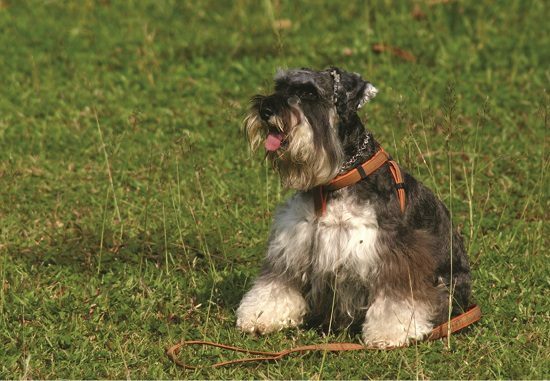 My first Miniature Schnauzer, “Oreo,” suffered from a number of them: when he was 13 months old, he acquired canine parvovirus. Despite his having been appropriately vaccinated against it, he had to stay in the hospital for 10 days and nearly died. When he was two years old, he was diagnosed as having epilepsy after several grand mal seizures. When he was three, his bladder began forming stones. He underwent surgery, on more than one occasion, to remove these stones. Eventually, he began suffering from potentially life-threatening bouts of pancreatitis that landed him repeatedly in the hospital. Finally, when he was nearly 12 years old, he acquired hemangiosarcoma (a malignant cancer of the cells that form blood vessels). 60 days after I received his diagnosis, he slipped away. As you can see, Oreo suffered enough disease for two or three Schnauzers. Fortunately, however, my husband, Jim, and I were always able to provide him the level of care that would bring him back to good health (except for the hemangiosarcoma). Such was not the case with “Jazz,” another of our Schnauzers. Just months ago, Jazz was diagnosed as having a disease neither Jim nor I had ever heard of: “immune-mediated hemolytic anemia” (IMHA). Never could I have imagined that his subtle lack of appetite one Saturday evening would foreshadow one of the most painful, most bewildering experiences of my life . . . The next morning, Jazz stayed in bed while Jim and I went down to the kitchen for breakfast. Normally, Jazz would wake up with us, stretch for a moment or two, then follow. Why wasn’t he standing at my feet? “Go potty, Jazz?” I called upstairs. Immediately, he trotted down to the laundry room where I was holding the door open. Per usual, he climbed down the three shallow steps that led to the grass and started sniffing. I went back to the kitchen for a few moments, then returned to the open door. “Come on in,” I coaxed him, but he just stood there looking at me. “Come on, baby,” I tried again. Again, he just looked at me. Apparently, he didn’t want to climb up the steps. Without much hesitation, I scooped him into my arms and carried him inside, noticing a reddish-orange splotch on my sweatshirt as I set him down in the family room. Uh-oh, I thought. He must have a cut on one of his paws. Either that, or his urine has blood in it—which would mean he probably has a bladder infection. Concluding that the blood was coming from his urine, Jim and I hopped into our car and took him to the local emergency clinic. By the time we obtained a sample of his urine for the doctor to see - less than two hours after I’d noticed the splotch on my shirt - it looked like pure blood. “Packed cell volume?” I wondered out loud. I thought his tongue looked a little off, but I honestly had not noticed the jaundice (yellow) in his eyes. The Cummings School of Veterinary Medicine at Tufts University is currently involved in clinical research to try to improve the treatment of dogs with IMHA. You can send your donation online or by phone: (508) 839-7905 or by visiting them online at http://www.tufts.edu - whatever method you choose, please specify that your donation be used for IMHA research. The Morris Animal Foundation are also accepting donations for IMHA research via “Meisha’s Fund #338. Donate online at "Meisha’s Fund #338". it makes me so sad to read about any fur child facing or dealing with IMHA . I too have a little girl who has IMHA . one minute she was fine then the next she wouldn’t get up. I picked her up and looked into her mouth… I do not know to this day why I looked inside her mouth. her gums were white. rushed to the vet and called on my way there. they were ready when I arrived we rushed her back to the exam room took blood test in less than one hour my girl was having a 4 hour transfusion. her pcv was only 8% that was when she was 7 years old and had a reaction to her shots never had this happened.. then 3 days latter we learned what a terrible disease IMHA was as I had never hear of this before my baby was faced with this terrible disease. many ups and down and 24/7 tlc home nursing.and many heart breaking up’s and down’s before things turned around now my little girl will be 10 years old this august she is like she was before the disease. I know there is no cure anything like stress or anything can trigger a relasp no cure only remission. I have learned to hold each minute as so special that we have this chance to love and enjoy being thankful for our special time .this is one of the most heartbreaker disease our fur child and pet parent ever is faced with other than cancer.i home cook did before this disease and still do I really think the diet has some what in way of healing. ever when my baby was in the special clinic I was able to bring home made food to her.i was allowed to visit 3 times a day then 4 times a day until she ready to come home. we were allowed to take her in the vets office to hold her for as long as she wasn’t acting over tired. when I brought my baby home I was so helpless feeling and scared. I stayed by her side as the predisone hit my baby had such muscel wasting they had to lower it some what but the azathioprine remained the same dose as her pet tinic and doxy and tummy protector. we took her to a special hospital for threaphy for strengthening her muscles weeks of doing that really helped her. her specialist and her regular vet were all in the same building that was such a help.for a month she had to go to the vet once a day to check her pcv. my girl was really slow and steady to get it to a safe place.her pcv stayed in the mid 20% for ever then started going up to 30%i never gave up and I think my baby fought so. my little girl is a tiny 2 lb Chihuahua but was the bravest little fighter ever. I am so thankful and blessed that 3 years latter she is doing very well and this disease can be beaten but not all do make it. some day maybe they will know more how to treat this disease. dr. jean dodds agreed with my babies vet on treatment which made me feel much better as she is a exspert on this disease and the friends from the sight where she gave advice gave me such wonderful advice.. I could not have made it without their support. as all you know how very scarry this disease that have had to face it with your fur child. I wish more would be put out about iaha/imha so pet parents know the signs to look for and what the triggers are even stress not just flea med ticks bee stings snake bites spiders shots some meds and ect. but any medication should not even be used to chance which pet might be triggered w/ imha. this disease can hit fast as it did with my little girl some you can see little things before the big hit. wishing everyone the very best and all the fur children everywhere.